TachoWeb is continuously developed further to support you in your daily business. In 2016 we added numerous features to the fleet management software. In our annual summary, we present a selection of this year’s highlights. For a smooth running of your daily business and your freedom to concentrate on important planning tasks, we are working diligently to make TachoWeb an even stronger companion for you. In 2016, we focussed on extending and refining the capabilities for tour planning, optimization and tracking. Other highlights were more extensive options for analysing and import features. Our summary gives an overview of this year’s most important developments. Networking of data opens up new ways of focussing information more specifically. The newly integrated tour monitoring in our premium product TachoWeb, which improves the tracing of the tour progress significantly in the daily business, is a prime example for that. This feature visualizes information about arrival times and feasibility of the planned tour as well as the tour progress in just one window. Thus, you can constantly monitor how currently driven tours proceed and detect unexpected incidents immediately. Detailed time-frame comparisons and forecasts on single tours provides the set-actual comparison, which was also embedded in the extensive tracking functionalities this year. 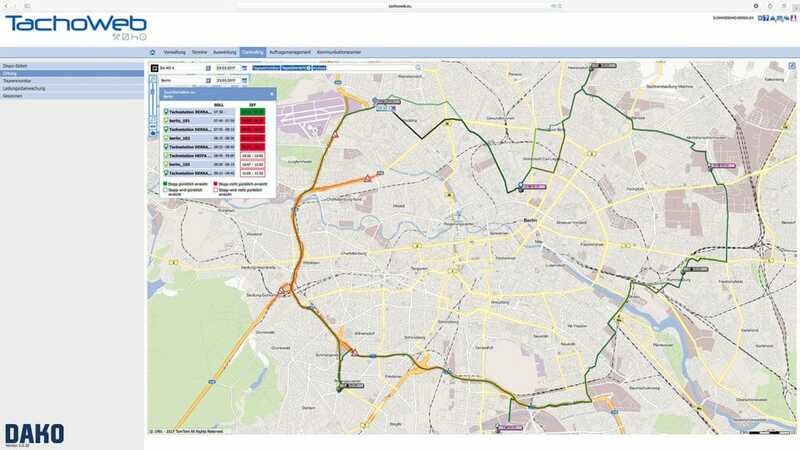 The visual analysis of driven routes based on live data enables you to react timely and prevent delays. The new features give you a greater reliability in the daily business as well as show optimization potentials which saves you time and money. An intelligent system not only gathers a high amount of data but also relates it sensibly and shows the results clearly structured. TachoWeb provides extensive options for analyses, which were further refined this year. The updated driver evaluation gives more precise information about driving behaviour. You can trace the development of the tacho grade of each driver in a diagram and recognize individual trends over defined timeframes. In order to achieve an evaluation as objective as possible the revised tacho grade now lists social infringements that result from incorrect operation of the tachograph separately. Furthermore, cross-references between driver, vehicle and tour show a better overview of saving potentials. As yet another feature, the vehicle list was extended as well. From now on, it displays all remaining driving times live at one glance, in addition to information about location, velocities and other relevant data. Every single information displayed in the overview can be extended in greater detail by clicking at it, which allows you to trace data like consumption or activities exactly. 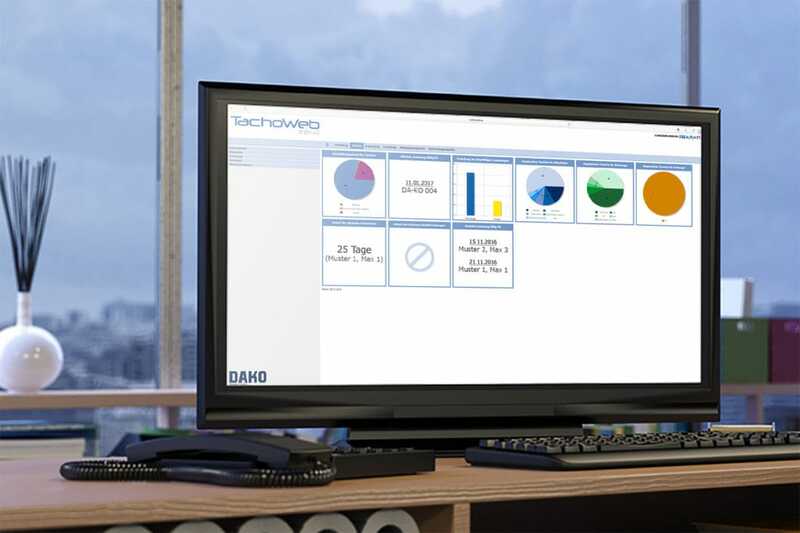 The extended data import features of TachoWeb ensure a smooth transition between systems. The data that can be imported easily with an excel file include not only master data of your employees and vehicles as well as all sorts of deadlines but also address data of your clients and tour stops. The imported data is immediately available in the system, even pre-defined tours can be transferred and configured via drag&drop. More transparent processes are achieved with the new company card administration. In a clearly structured way, TachoWeb offers you an overview of all your company cards and their respective vehicles and card expiry dates. Without time consuming research, you can find out quickly which vehicle has been read out by which card most recently or identify vehicles with deactivated cards. Thus, you avoid the mixing-up of cards and costly fines. Another novelty are the expanded options in the management of driving licence data. Here you can enter the expiry date of the key number 95 as well as the date of successfully completed BKrFQG modules. The automatic transfer into the deadline management ensures that you don’t miss any renewal deadlines and can schedule due training sessions.